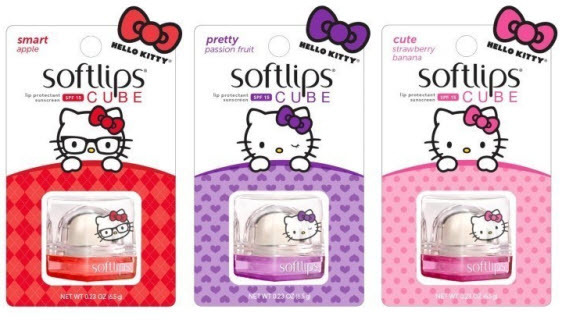 Sanrio and Softlips have collaborated on a Hello Kitty lip balm collection. The lip balm is packaged in a glass-like cube with flavors inspired by Hello Kitty's favorite things. There will be a total of four flavors in the collection. The first three flavors include apple, passion fruit and strawberry banana. A fourth flavor will be revealed in November. The first three flavors will arrive in retailers nationwide in July 2015. The Hello Kitty lip balms will retail for $3.49 each. The four piece gift set will cost $12.99.